If you’re a fan of The Walking Dead like me and watched the mid-year ending episode, you saw a fantastic demonstration of the skills necessary to survive the zombie apocalypse: Guns blazing, grenade throwing, and some good old gut the Governor with a sword. Once again, a safe home was lost, and Rick with his group have to escape the prison before it's swarming with walkers. Sure some made it out on a bus. But most had to exert one of the key skills required to survive the zombie apocalypse: physical fitness. Now when I say physical fitness I’m not talking about how diesel you are— when you get swarmed by the herd it is unlikely that your 300 lbs bench press or your 500 lbs dead lift will come to your rescue—or how flexible you are—it is just as unlikely that your Parivrtti Trikonasana to Prasarita Uttanasana yoga pose will allow you to twist and flip through the herd like you’re Eddie Gordo from Tekken 3. No when I say physical fitness I am talking about the often hated and often overlooked component in everybody’s program—Cardiorespiratory Endurance. If the zombie apocalypse happened tomorrow, would you be like Andrea? When your safe house gets swarmed by the herd and you’re left for dead by your group with nothing but your legs and a bag of guns--would you end up getting run down by a bunch of walkers? Or rather would you be a real survivor? One able to book it, put some real distance between yourself and the herd to get away unscathed? 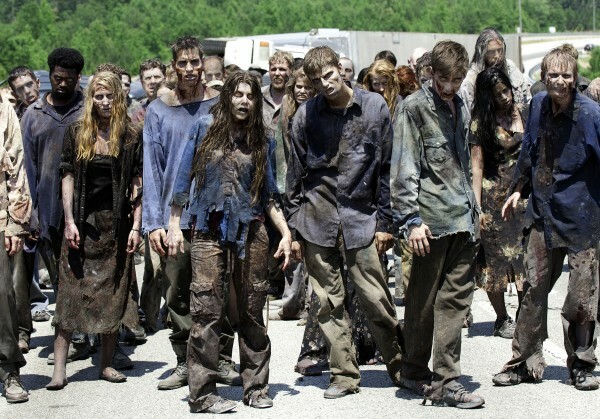 On The Walking Dead the fastest walkers ambulate with a brisk walk. In the exercise physiology realm we quantify a “brisk walk” as 3.0-4.0 mph, which translates to a 15-20 minute mile. Assuming that you would want to be moving at least 2x the rate of the fastest walkers, you would need to be able to run at 8 mph, which translates to a 7 min 30 s mile. However, running one 7:30 mile won’t be sufficient. Walkers are driven by the sight and sound of their prey. Which means you can’t just put a couple football fields between yourself and the herd---you have to completely leave it in the dust. You have to get out of their sight range. At sea level the curvature of the earth limits the range of human vision to about 3 miles. This will act as our approximation for safety (i.e. you have to put at least 3 miles between yourself and the herd). Maybe you’ve come across some freshly turned walkers and their eyes haven’t developed cataracts yet. The numbers show that you would need to be able run at a 7:30 pace for 45 minutes (six miles total) to be able to safely exit the sight range of the fastest walkers. If you can’t do this then at the most basic level you can never be sure that you would survive the zombie apocalypse. At some point your safe house will be over run. At some point you will run out of gas. At some point you will be left behind. At some point a herd will find you. And when they do--they will run you down. Remember a dark hooded badass won’t always be there to save you at the last minute when you collapse from fatigue. If you find this physiological requirement for surviving the zombie apocalypse daunting-- don’t worry. You’re not the only one. Most people reading this article probably feel the same way. But on the same note, most people won’t survive the zombie apocalypse either. At least now you are aware of the cardiorespiratory requirement and can begin working towards satisfying it. More on the exercise physiology of surviving the zombie apocalypse to come! David Lawton is a Doctor of Physical Therapy candidate at Duke University.